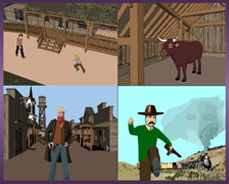 The new Western Props and Locations Add-On for StoryBoard Quick v.6 captures the essence of the Wild West and brings it right into your storyboards! You'll be "Unforgiven" if you are working on a Western-themed project without the help of our latest Add-On. Tons of Western-themed props and great-looking locations will help you be finished with your boards well before "High Noon." 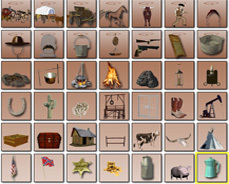 Western Props & Locations are easy-to-access and quick-to-use. Guaranteed to be faster and better-looking than any other quickdraw out there. Everything from stagecoaches to gunslingers, horses to gallows, the Western Props will accent your boards without costing you a "Gold Rush." Wild West Locations bring you right into the saloon and on the dusty roads of the western towns. When it comes to the locations there's only "The Good" (none of "The Bad & The Ugly" here!). With these new graphics, you'll blaze a trail of great-looking storyboards!